The negative effects of fossil fuels have been speculated upon and known for a long time. The larger scale concerns, awareness, and now actions have largely occurred in the last 25 years. Many people actually think that it was Al Gore who first alerted humanity to the issue of Climate Change. Here is a partial list of expressed concerns from the last 100 years. In March of 1915, Alexander Graham Bell gave a speech that addressed energy use and climate change. He stated that the oil and coal industries should not be solely relied upon as they are being taken out of the ground and cannot be replaced. He went on to say that humanity should harness natural power such as tidal power and solar panels. According to his grandson Bell had drawn sketches of solar panels sitting on rooftops. Just think, one of the greatest inventors of all time was concerned about the consequences of using fossil fuels 102 years ago! In 1958 Bell Telephone Science Hour there was a show – produced by Frank Capra – that strongly suggested that humanity, with the fossil fuel by-product of CO2, could be triggering a change in climate. It was mentioned that several degrees of warming would melt the polar ice caps and create a “great inland sea in America”. In 1962, was the publishing of “Silent Spring” by Rachel Carson, often looked to as the beginning of the “environmental movement”. In 1968 when we saw the first picture of the whole earth from space. Then 1970 was the first earth day. Then 1971 was the first time in history that humanity consumed more earth resources than the earth could replenish in a year. [We are now at 1.7 earth’s resources consumed in a year]. In 1973, the movie “Soylent Green” famously presented a planet with year around heat waves. In 1988 the legendary scientist James Hansen resigned from NASA as he felt he was not being allowed to speak freely about the science of Climate Change. Al Gore’s “Inconvenient Truth” came out in 2006. 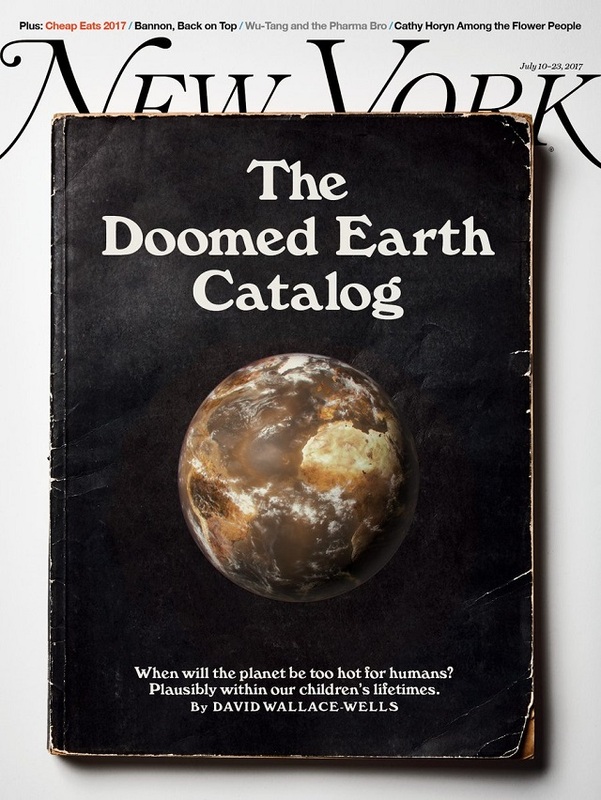 So, for the last 100 years there has been the concern, scientific discussion and popular cultural references to Climate Change, warming of the planet and the danger of what it might do. As of today, we have yet to do what is necessary to slow it down. Humanity has continued to increase fossil fuel emissions and the average temperature of the planet has now increased to more than one degree centigrade. Two degrees is considered truly catastrophic. The Paris Climate Accord was initially thought to do this. Updated science points to the reality that the Accord may be able- with full, non-enforceable cooperation – to only be good enough to keep the temperature increase to 3, 4 or possibly 5 degrees centigrade. However, we are already living with catastrophes with the current level of warming. Huge losses from fires, floods, ever more frequent and intense storms continue to increase every year. In a blog post in September 2015 I forecast that 2015-2016 would be the peak of fossil fuel emissions. I made this forecast as 2014-2015 were the first two consecutive years in decades that greenhouse gas emissions did not increase but stayed the same. They also did not go up in 2016, so I thought we had reached the peak. As a Futurist and co-author of a book and co-founder of a non-profit to face Climate Change I felt optimistic that a corner had been turned. Well it looks like I was wrong and overly optimistic. The United States and Europe have been slightly down trending greenhouse gas emissions since the beginning of the Great Recession but the growth of emissions from China, India and most of the rest of the world have skyrocketed. This leads to a key point many people forget. This is a planetary problem. Everyone is downstream or down-wind from someone else. The atmosphere accepts CO2 regardless of national origin. In the same week, some 15,000 scientists, members of the Alliance of World Scientists issued a stark “Warning to Humanity.” Once again the ongoing 6th extinction event now occurring was mentioned, along with some major, urgent actions to take to keep this mass extinction event from running its course. In each of the prior five extinction events 71-97% of all species became extinct and it took 20-100 million years to have a new biosphere develop. The current extinction rate is 150+ species per day. This is an estimated 1,000-10,000 greater than the background or natural rate. Greater than any time since the last mass extinction event 66 million years which ended the reign of the dinosaurs. The five previous extinction events were caused by various events. This current extinction event is the first ever caused by a single species, humans. The truth of Climate Change is NOT that we are trying to” save the planet”. The planet is expected to be around for another 3.5 billion years. Climate Change is about saving ourselves from ourselves. The reality of climate change, discussed and forecast by scientists from multiple disciplines for decades, has been debated in the world and specifically the United States. This irrelevant debate and the delaying of any coordinated cohesive actions, has now brought us to the possible reality is that the tipping point for climate change is close at hand, if not already passed. If all greenhouse gas emissions were to stop globally the day you are reading this column, there would still be global warming and climate change for the next 2-3 decades as all our emissions of the last 50 years are baked into the planetary system. This means that we can’t alter climate change between now and 2040, we can only slow it down for 2040-2100. The longer we wait the worse the disruption and catastrophes. There is no longer any time for debate, only facing the worst-case scenario. Now that we have had 100 years of discussion about how fossil fuels and CO2 are threatening life on Earth we have to sound the alarm bells. There is no time to pander to those folks – now single digits in polls of Americans- who like to gain some satisfaction from being “climate change deniers”. -the rapid melting of ice and permafrost could unleash the viruses of the 1917-18 flu pandemic and even the bubonic plague, in this century. Whether all of these things might happen no one alive today can definitively state. Please read this article as it will change your thinking about Climate Change to know that all described in the article could happen. The moment I finished this article, I knew that it would be a tipping point. In the months since there has been an intense discussion at all levels of scientists and others about whether to start to openly and loudly speak about the worst-case scenario. Among the high level and incredibly brilliant people I am fortunate to be involved with the answer is clear: yes, time to speak worst case scenario! More than a decade before the year 2000, computer scientists started to worry out loud about what might happen when the calendar moved from 12/31/99 to 1/1/2000. The reason for this was obvious: computers were invented in the 20th century so all coding and programming was based upon 20th century dates. What might happen when the year 2000 begins? Nobody other than computer scientists thought much about this until the mid 1990’s when the thoughts of possible nightmare events were suggested. A government study in 1996 suggested that the IRS and the Social Security Administration might be crippled. Then the potential disasters of planes falling from the skies, the collapse of the financial system and equity market started to be talked about. What most people have either forgotten or don’t know is that this open concern and panic led the United States to spend $100 billion to address the bug, more than 90% of that being spent by the private sector. Globally it was estimated that $580 billion was spent to fix Y2K. Evidently this money was well spent as hundreds of companies and agencies of the United States government realized that they were more vulnerable than expected. So, billions of dollars over five years was spent to prevent catastrophe. This is the forgotten part of Y2K which how is often a joke punch line that there was a lot of anxiety but no problem. There was a huge problem but intensive effort and huge amounts of money prevented potential catastrophes. All because all these imagined worst-case catastrophes were addressed in advance. A perfect lesson for facing Climate Change. This past October I had the honor and privilege to deliver two presentations over a four-day period at NREL, the National Renewable Energy Laboratory, to help celebrate their 40th anniversary. Since my first visit to NREL more than 8 years ago, I have been a huge fan. Simply put, some of the brightest people in the world around all new forms of energy work in a magnificent campus in Golden CO. So, on my last day on campus I had the great pleasure to speak following an address by Dr. Martin Keller, the Director of NREL. He used an analogy with the audience of executives from across the United States that I have used ever since. Dr. Keller asked the audience to imagine that they had just boarded a plane for Europe with their entire family. As the family was settling into their seats, the captain comes on the intercom and welcomes all aboard but with a caveat. “Ladies and gentleman”, the captain says “I want to let you know that there is a 10% chance of this plane falling into the Atlantic, so if you want to get off the plane you can”. Dr. Keller then asked the audience to raise their hands if they would take their family off the plane. All hands went up. [I have done this several times since then, and all hands went up every time]. The audience, when faced with the worst-case scenario of 10%, all said they would get off the plane. Well, if there is even a 10% chance of the worst-case scenarios of Climate Change occurring, should we not take preventative measures? It is clear to me and some 15,000 scientists that we are very close to some tipping point. It might have already occurred, but if it hasn’t, we have to take drastic actions by 2030 at the latest to prevent it. There is even a growing sense among the leading thinkers today that 2020 should be looked at as a key date for having begun massive planetary preventative measures. I think that the percentage possibility for many worst-case scenarios is much higher than 10%. More like 50%. So, it seems logical, intelligent, compassionate, and of common sense to start to do whatever it takes to prevent current catastrophes from growing in number and intensity. If the worst case is real then we can minimize it through urgent and preventative global actions. We buy fire insurance, not because we hope for a fire but in case one occurs. We buy home owners, automobile and health insurance, not because we expect bad things to happen, but in case they do. At the very least we should face the future of the only place we have to live – Spaceship Earth- with the same mindset as we do with our possessions and health. May the conversation about Climate Change now become one of how to prevent the worst-case scenarios from happening. Our children and grand-children will thank us. Maybe, as what has already been set in motion will make their lives profoundly different than ours have been.